Need to keep hands on the lap instead of on others? For some kids, keeping their hands busy helps them listen too. Tactile tools and fidgets provide an outlet for antsy hands and fingers. Instead of playing with shoelaces or hair, kids can use colorful fidgets as an outlet to curb wandering fingers. Kids with a weaker core and low tone need more support around their hips and backs to hold their bodies up. They might struggle with sitting cross-legged on the floor and turn to rolling around. 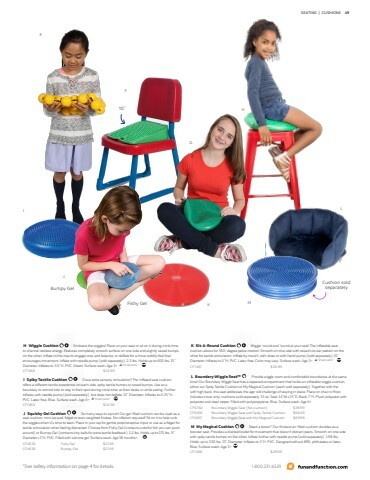 A lightweight, foldable chair or a beanbag chair adds support so students can sit and focus. as kids get bored with toys, using the same sensory tool over and over can get old. Keep your toolkit fresh by rotating in new items. Kids will look forward to seeing what’s new. Encourage kids to pick out their own sensory tools to gain self-awareness of what helps them self-regulate and attend. ovide grounding weight to stay in place. Weighted lap pads provide gentle pressure and input to the joints, which has a grounding effect. This proprioceptive input calms the body and helps to keep the wiggles at bay. Add a soft, smooth slipcover that children can touch and feel for the tactile input they crave. in place. They also serve as seat markers to teach personal space without touching others. e eyes something else to focus on. they listen. They might find looking at the teacher distracting or uncomfortable. Colorful fidgets not only keep fingers busy, but also give kids something else to focus on, further helping to improve eye contact during circle time.